The key to a good life is not giving a f*ck about more; it’s giving a f*ck about less, giving a f*ck about only what is true and immediate and important. “The Subtle Art of Not Giving a F*ck: A Counterintuitive Approach to Living a Good Life” is written by Michael Manson. Michael Manson hypothesizes that modern life makes us care about a lot of insignificant things by warping our values. Hence, we need to choose only what is important in life. This book will teach you to think more clearly about choosing what is actually important. The author starts off by explaining what the book is. 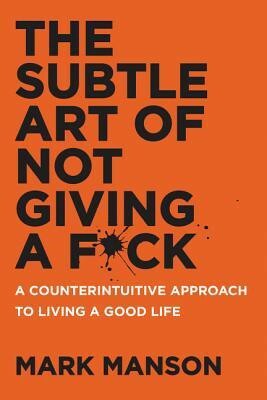 Michael Manson explains that not giving a f*ck does not mean apathy but rather, giving a f*ck only about things that matter. The next chapter deals with happiness. We are then reminded of the fact that pain and loss are inevitable. True happiness occurs only when we find the problems we enjoy having and love solving. We learn about entitlement and the entitlement culture that is pervasive today. The truth is that we are all average. Even if we were a Sachin Tendulkar or an Albert Einstein, we tend to be exception in one field and average, at best, in others. Modern living (and social media) has given us this illusion that somehow all of us are princes hiding as frogs. We then come to the chapter on values. Unfortunately, we are bombarded with messages that reinforce values based on external events (having more than your peer, being attention wh0res, etc.). The good values are those that are internal (honesty, charity, etc.). Taking responsibility for one’s actions is the theme of the next chapter. We can’t control what happens to us, but we can control how we interpret and react to what happens to us. Next, we come to the chapter on bias and self-image. After which comes the chapter of failure and how it leads to success. After which, comes the chapter on learning to say no to things that are not in alignment with your values. The last chapter, fittingly, is on death and how we react to it. Each of the chapters has plenty of anecdotes and variations on the central theme. This book is profane. I mean it. You have profanity in the title and you have tons of profanity in the in the initial chapters. But this profanity serves a purpose. It adds to the humour. And it adds to the no holds barred style of writing that Michael Manson employs. Even without the profanity, ‘The Subtle Art of Not Giving a F*ck’ is still filled with humour and poignancy. In fact, this is one of the best written self-help books I have read this year. Like most well written books of short length, punchy insightful dialogues abound. These insights have been derived from Michael Manson’s own hard knocks in his life. They make you sit up and think. The philosophy espoused in this book is distinctly ‘Eastern’ as opposed to the usual ‘Western’ philosophy that is prevalent nowadays. This is refreshing since somewhere along the way, we have lost what made our lives meaningful and this book helps reorient us back to ‘true north’. The only nit pick I have is I wished this book was named better because most people might pass up on such a great book due to its “frivolous title”. However, as I have mentioned earlier, there is profanity — basically, the word ‘f*ck’ is used in a lot of inventive ways. So, if you are easily offended or are a prude, stay away. But if you are not, this is a great book. It is a short read and a much-needed antidote to conventional western ways of thinking.